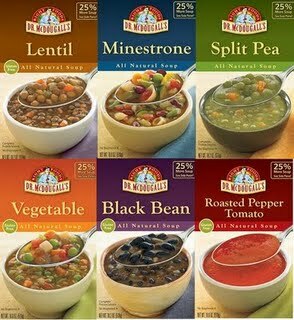 Dr McDougall’s Ready to Serve Soups | Cook. Vegan. Lover. Overall we loved these soups and I would buy them for sure. They are great to have on hand for lunches and are low in calories (most abour 150-200 in the entire box) and are filled with great non-chemical/preservative ingredients. They are also low in sugar and fat which are two additional bonuses! This entry was posted in review and tagged dr. mcdougalls. Bookmark the permalink. I have his instant soup (the kind you add water to in the cup) and didn’t care for it. I will have to try these and see if they are better!